It's fire season! A fire has started somewhere in your town. Dispatch your fire fighting units to out the fire before it spreads! - 1 - 5 = Hotbar hotkey. - Left Mouse Button = Select Unit / Place Unit / Move Unit. - Scroll Wheel = Zoom in / Out. - Scroll Wheel Click and Drag = Move Map. - Spacebar = Cancel selection. - Del = Send selected unit home. - Backspace = Send ALL units home. - BackQuote or H = Toggle HELP (Pause) panel. Located at the bottom of the screen are the units you can deploy. Click the button or press the corresponding number key to select a unit. Then click the map where you want to deploy the unit. 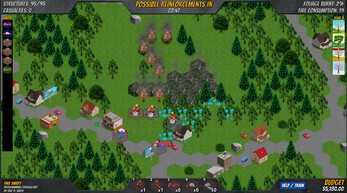 #1 - Response Company can remove foliage to create fire blocks. #2 - Engine Company use hoses to dowse flames and prevent them from spreading. Must have an Engine nearby. #3 - Engine will provide the Engine Company with water. Engines will fill with water when they are on road. 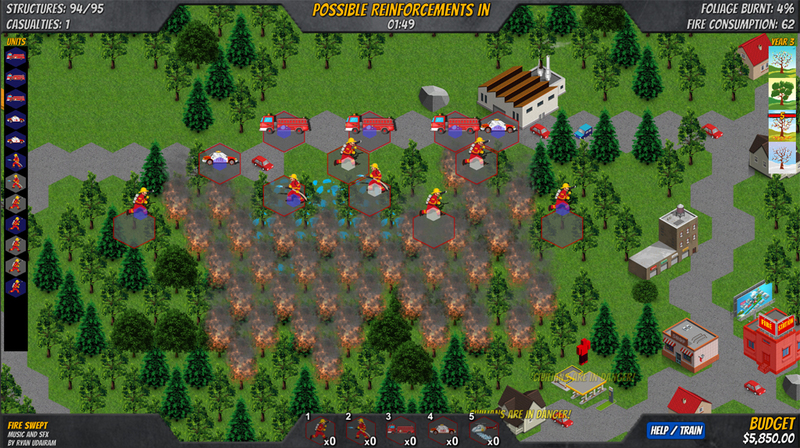 #4 - Fire Chief provides a 25% effectiveness bonus to units within a 4 tile radius. They can also evacuate structures. #5 - Helitanker can drop water on a wide area to dowse flames and prevent fire spreading. Must be sent home to reload with water. When a fire breaks out, dispatch your available units to fight the blaze. Every 3 (three) minutes, new reinforcements MAY arrive depending on the urgency and size of the fire. 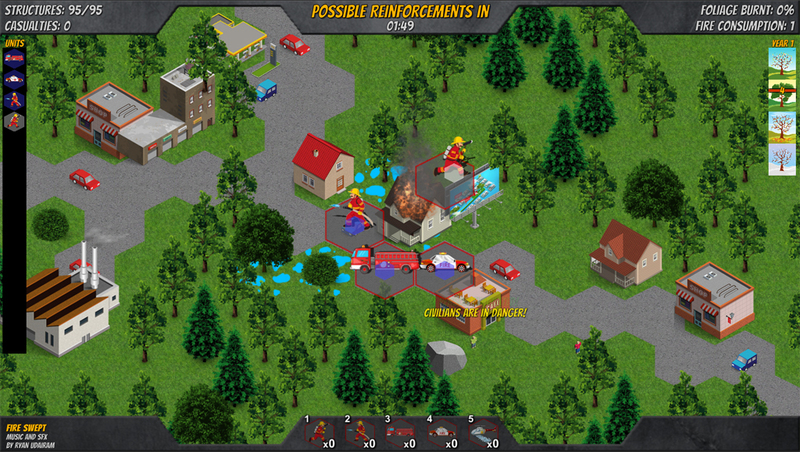 Use the Fire Chief to give a bonus to units and to evacuate structures of people. To move units, click the action dot to select the unit and then click a destination to move to. When the unit is selected, the action dot will grow large and flash. You can press the SPACEBAR to cancel the action. 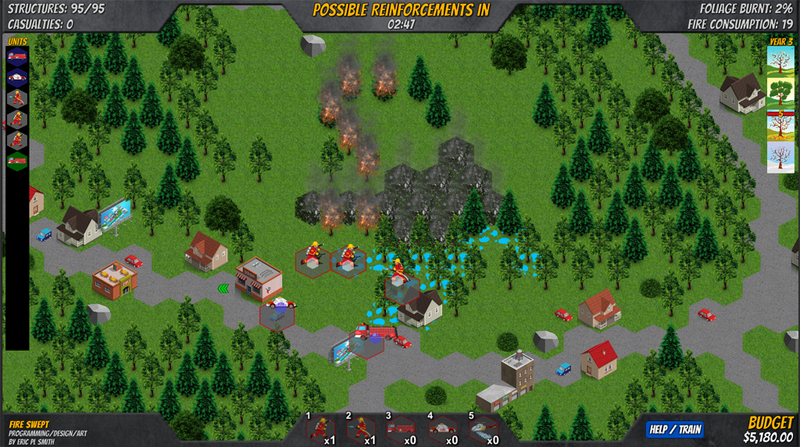 Moving units through fire have a chance of destroying the unit and they become a casualty. - White = The unit is idle; taking a break. - Green = The unit is moving. Check out my tools for Unity!